A remarkable architectural achievement, villa Artepea was designed to fully optimize its environment in the heart of the Domaine de Lurin. Johannes Zingerle's project is harmoniously integrated into the land thanks to a bridge, a unique feature in St Barths, a lift and a building set over three levels.The surrounding nature blends beautifully with the lovely tropical garden, where you can through the stone paths and across the beautiful lawn, smelling the delicate scent of jasmine.For the design, stone floors and customized wood furnishings provide a natural, mineral atmosphere, where elegance and simplicity prevail.For the layout, the main floor has a fully open lounge/dining room that extends onto the terrace where you can laze in the sun next to the long emerald pool, facing St Jean bay. The kitchen, a TV lounge and a first bedroom can also be found on this level.The master bedroom occupies the 1st floor, with a huge sofa facing the panoramic window, a designer desk, and height of luxury is an outdoor bathtub and shower, nestled in an alcove.The garden level offers two bedrooms and the technical rooms. 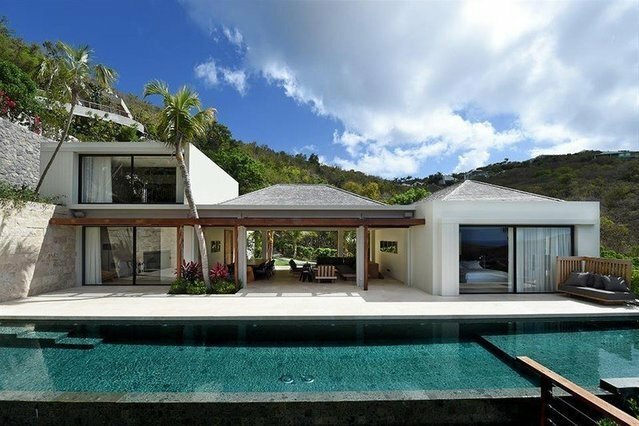 The villa also has high-tech equipment, including a home control system and curved flat screen televisions.Modern and refined, yet still warm and inviting, villa Artepea ideally reflects tropical elegance.